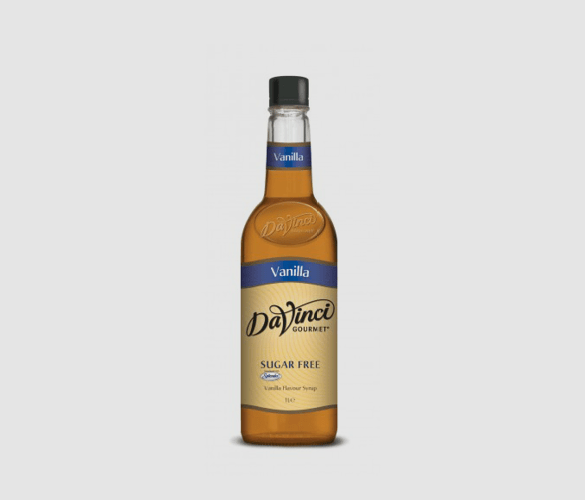 DaVinci Sugar Free Vanilla Syrup is a great tasting, low calorie substitute to other more traditional options. This 1 litre bottle offers great value for money as it yields up to 60 flavoured coffees. This gourmet product allows you to easily expand your hot and cold drinks menu to appeal to even more customers in no time. A classic vanilla flavour paired with no calories is a great way to win over customers. This is a great way to liven up any coffee. If you are new at trying flavours in your beverages, this is a great option to start with as it is such a popular choice. How Many Calories are in Sugar Free Vanilla Syrup? This zero calories, sugar free addition to your menu is ideal for the conscious customer looking for a “skinny” or diabetic friendly, flavoured coffee or latte. This product is sweetened with Splenda, a sucralose-based, natural tasting sweetener which ads 0 calories, 0 sugar and 0 fat to your hot drink offerings. Our sugar free syrups allow you to offer flavoured coffees and hot drinks without the added sugar, fat and calories. These sugar free syrups can be added to a dietary specific menu as a diabetic friendly option, or to your main menu as a great tasting, low calorie drink. A huge benefit of this product is its versatility. It is certainly not limited to coffees and can be used in so many ways, with a little creativity. We love this healthy high-protein low calorie granola bar recipe from Snap Guide. We simply swapped the maple syrup for our calorie free option and converted the American measurements for you. Mix all the wet ingredients in a bowl and add in the protein powder. Soak the dried cranberries in a bowl of water for around 5 minutes and then drain. Then stir the powdered milk, oats and cranberries to the mixture. Add the salt, vanilla and cinnamon. Pour the mixture evenly into a baking tray and put into the oven for around 15 minutes, or until golden brown. Each bar is roughly 118 calories with 8.3 grams of protein (depending on the size of yours bars), so this is a great healthy snack to keep your energy up throughout a busy day! Tried a variety of vanilla syrups but this sugar free variety adds just the right hint of vanilla to enhance my preferred sugar free coffee taste.